We can’t talk about Molecular Diagnostics without possibly talking about DNA, and with DNA, comes mutation. Much of the work I do revolves around searching for specific variants in a patient’s DNA sequence. We all have mutations in our DNA, but does that mean we all are affected negatively? Absolutely not. Spontaneous mutations occur during normal process such as DNA replication and repair within our cells. They also can arise from exposure to ionizing radiation, UV exposure, and chemical agents. Some mutations are passed down through reproductive cells. Mutations can be categorized as harmless or sometimes hurtful giving rise to gene defects, copy number variants, metabolic deficiencies, and cancer, while others result in positive effects. Somatic mutations occur in cells that aren’t reproductive in nature. These mutations for the most part do not have a blatant effect on the organism because our normal body cells are able to counteract the mutated cells. However, sometimes mutations in somatic cells can affect division of cells, which has the potential to result in forms of cancer. On the contrary, germ-line mutations occur in reproductive cells and have the possibility of being passed down through generations, resulting in the presence of the mutation in all of the organism’s cells. A T G C bases, along with a sugar, and a phosphate group combine to form a polymer of nucleotides. This polymer backbone of alternating sugar and phosphates is what we call DNA (Deoxyribonucleic Acid). DNA is transcribed to RNA (Ribonucleic Acid) which instead of Thymine (T) contains a Uracil (U). Finally, RNA is translated to protein. Notice how the structure of the gene product is unchanged. 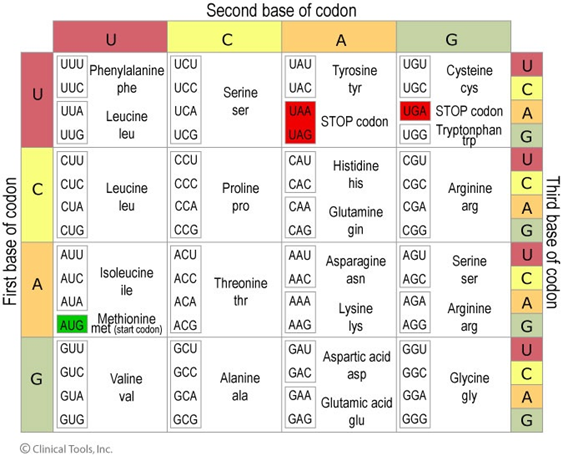 This happens because all amino acids can be encoded by more than one triplet codon. Frame shift mutations can result from either a single base insertion or a single base deletion. Sometimes changes in the actual chromosomal structure or number take place in the cells. These changes can result in deletions, duplications, inversions, and translocations of chromosomes. Chromosomal deletions and insertions are simply the loss or gain of chromosomal material. Inversions result from the removal, flipping, and then reconnection of the chromosomal material within the same chromosome. Translocations are more complicated and involve switching of genetic material between two chromosomes. A reciprocal translocation occurs when parts from two different chromosomes exchange. We call a reciprocal translocation “balanced” when there isn’t a gain or loss of genetic material between the chromosomes (both chromosomes remain fully functional). An “unbalanced” reciprocal translocation affects an offspring’s phenotype due to extra or missing genes. This information I have touched on is very general, however, it doesn’t mean it is not of importance. These basic concepts are the fundamentals needed to begin understanding mutation as they will provide us with the framework for recognizing the needs and importance of molecular diagnostic testing! -LeAnne Noll, BS, MB(ASCP)CM is a molecular technologist at Children’s Hospital of Wisconsin and was recognized as one of ASCP’s Top Five from the 40 Under Forty Program in 2015.